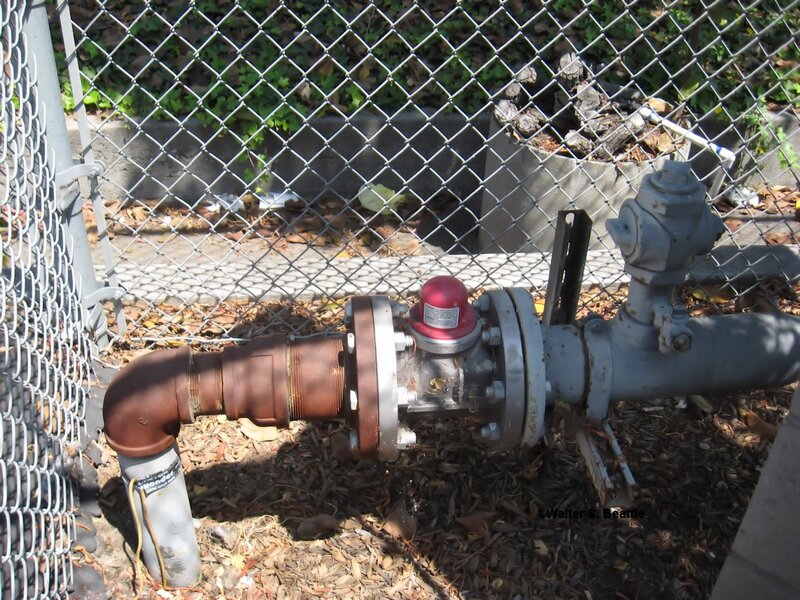 An earthquake actuated gas shutoff valve installed on a gas line will go a long way to reducing the fire following earthquake risk at your facility. During an earthquake, one of the most serious threats to your facility is from natural gas. During an earthquake your entire building shakes. The pipes in your building are under stress. They will shake and may break at the fittings. Whatever is contained within the pipes will leak, whether the material is sprinkler water, process gas, compressed gas, or natural gas. This is why earthquake bracing is required in earthquake subject areas. If your gas line is broken inside your facility it will usually find an ignition source. The ignition source may be from broken wiring, pilot lights, or heat sources. If the gas supply is not immediately shut down, gas could flow uncontrolled from the broken pipe, feeding a fire within your facility. This condition is sometimes called a “Fire Following Earthquake” fire. The municipal fire department and emergency responders are going to be responding to the most immediate life safety crisis. That may be a bridge, the grade school, or a hospital or nursing home collapse. Emergency resources will be expended first at locations which pose the greatest life safety risks. Property emergencies will take a secondary response priority during an earthquake. An earthquake actuated gas shutoff valve or an excess flow valve (EFV) will go a long way to reducing the fire risk at your facility. The device should be UL listed and/or FM Approved. The purpose of the devices is to shut down the gas flow in the event of a broken pipe. Each operates slightly differently. Each of these valves are available in various sizes, typically from 3/4 inch residential size to 8 inch industrial size. Most valves may be installed by any competent plumber or maintenance person. An earthquake actuated gas shutoff valve has a ball on a post. When the ball is properly balance on the post, the gas will flow normally. When an earthquake shakes the valve, the ball will flop off the post, and the valve will immediately close in the fully shut position. An excess flow valve will sense a larger than normal flow, and will shut down automatically. These valves will operate with not only an earthquake, but any pipe breakage. If one of your forklift operators goes too high and hits and breaks the natural gas pipe, the excess flow will immediate shut off the gas flow at the source. The excess flow valve works by placing a movable spring loaded plug within a restricted area of the valve pipeline. The plug sits in the pipe and allows gas to flow around it. If there is flow of gas beyond the flow limits of the system, or an excess flow of gas, the plug will be swept up and will plug itself against a gas shutoff seat. This will shut down the flow of gas. Some valves are spring loaded so that after repairs, the spring will allow the plug to return to its normal position. EFV’s may also be installed underground, such as at the entrance to your property. The valve will also help protect against excess flow from physical damage, such as your gas line being struck and severed by a backhoe or digging machine. Each of these valves may be used for various gases. If you have an industrial process with a flammable or anesthetic gas, each of these valves may be employed as a safety device. Check with your local gas provider or building code enforcement department to ensure the valves are properly installed. Remember, once one of these devices operate, all the pilot lines will go out. You must not reset the device or turn the gas back on until the gas company or other qualified person inspects, repairs, and relights each pilot line. This entry was posted on Saturday, January 21st, 2012 at 3:31 pm and is filed under Uncategorized. You can follow any responses to this entry through the RSS 2.0 feed. You can leave a response, or trackback from your own site.